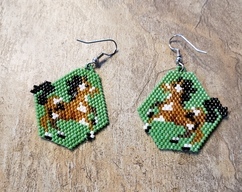 These pretty earrings are done with size11 delcia seed beads. They measure 2" long. These earrings are made by my hands. The designer of these earrings is Star Design. Thank you for looking at my bead work. Life is better than good.